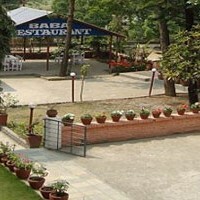 Baba Lodge & Restaurant is located in one of the best areas in town. It is a pleasant place to stay in Pokhara, Lakeside. It is situated by the Lake with beautiful mountain views of Annapurna range and the majestic Machhapuchhre. It is also very close to shop, restaurant and postal service. The hotel premise include nice and neatly done garden which is a very ideal place for sun and the secenery. – Rooftop garden with excellent view of the mountains and the lake. – Boiled and filtered drinking water in all the rooms. – Clean and Quite atmosphere and nice garden. – Every kind of travel arrangement. – Restaurant offering Nepalese and Indian food as well as a wide range of European cuisine. – We accept Visa and Master card.